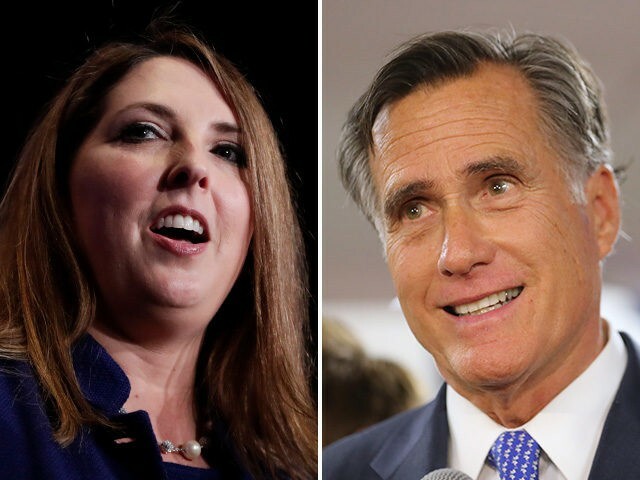 Republican National Committee chairwoman Ronna McDaniel criticized her uncle, incoming Sen. Mitt Romney (R-UT), on Wednesday for publishing an op-ed on New Year’s Day blasting President Trump. Romney’s actions have sparked concerns he will try to make a primary run in 2020. McDaniel’s tweet was seen as an early attempt by the GOP to quash potential primary challengers, but it remains to be seen if action will back up her rhetoric. Jevon O.A. Williams, U.S. Virgin Islands national committeeman on the RNC, sent out a strongly worded email to fellow RNC members on Tuesday. He called for the RNC to amend its rules at the organization’s meeting later this month and thereby discourage potential challengers from running against Trump. My friends, you know what’s going to happen. Messrs. Romney, Flake, and Kasich will continue chasing their fantasy of being president, even if that means destroying our party and denying President Trump re-election. Look, the political history is clear. No Republican president opposed for re-nomination has ever won re-election. “Unfortunately, loopholes in the rules governing the 2020 renomination campaign are enabling these so-called Republicans to flirt with the possibility of contested primaries and caucuses,” he said. “Any contested re-nomination campaign—even a forlorn hope—would only help Democrats,” he said. “This resolution would also declare him the presumptive nominee in 2020. I intend for both of these items to be acted upon at the winter meeting later this month, including, if necessary, by suspending the rules to take up this business,” he wrote. “Like other Big Government Republicans who never liked Reagan, Mitt Romney wants to signal how virtuous he is in comparison to the President. Well, I’m most concerned and pleased with the actual conservative reform agenda @realDonaldTrump has achieved,” he tweeted.